Dine in Cafe Lombardy - Save 20% off your food bill one night of your choice. Discount is not applied on alcohol. Rate Description: Dine in Cafe Lombardy - Save 20% off your food bill one night of your choice. Discount is not applied on alcohol. 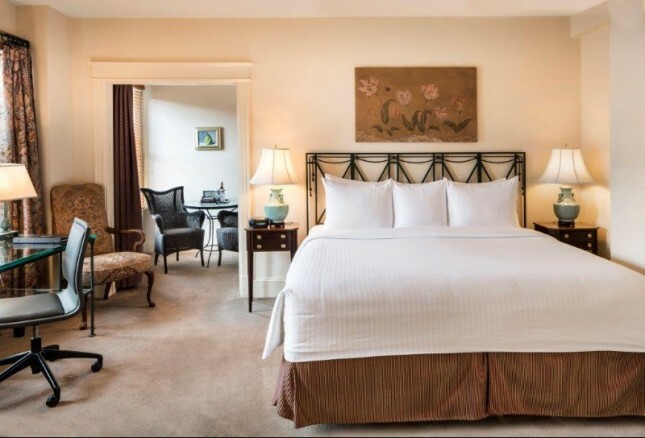 Our spacious Superior King room is an average of 325 square feet and features a Sealy Posturepedic mattress with Luxury Frette bedding and duvet with a comfortable workdesk and chair. Each room is equipped with a 32 inch LG LED HD television, complimentary wireless internet and features two-line telephones with data ports and voice mail, bathrobes, hairdryers, iron and ironing board, mini bar, deluxe bath amenities, custom upholstered vanity, ceiling to floor mirrored closet doors and current periodicals. Maximum capacity for this room is two 2 people. 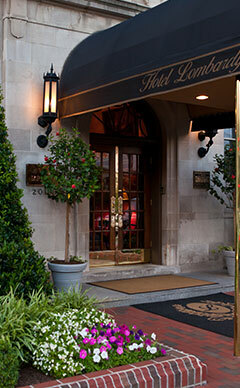 Situated in the historic Foggy Bottom neighborhood, Hotel Lombardy is a sophisticated destination in the heart of Washington, DC. The perfect starting point for business travel or adventure, we're just minutes from iconic attractions, shopping, dining, and entertainment. See the city from the Washington Monument observation deck. 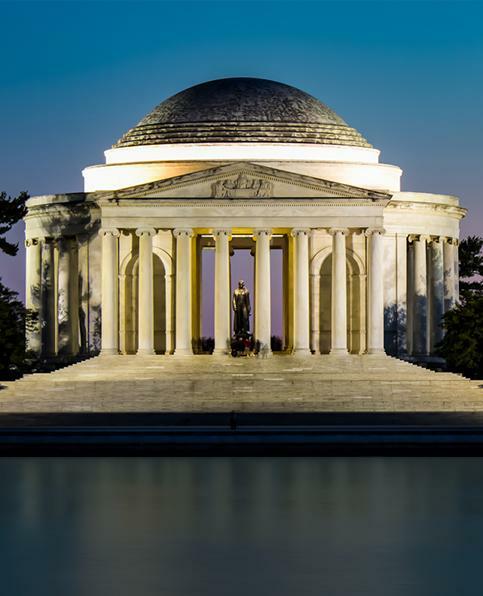 Relax in the park on the National Mall and take in the views of cherry trees along the Tidal Basin. Visit the Lincoln Memorial or tour the White House and United States Capitol Building. Wander through exhibits at the Smithsonian Institution Museums or see a concert at the Kennedy Center. 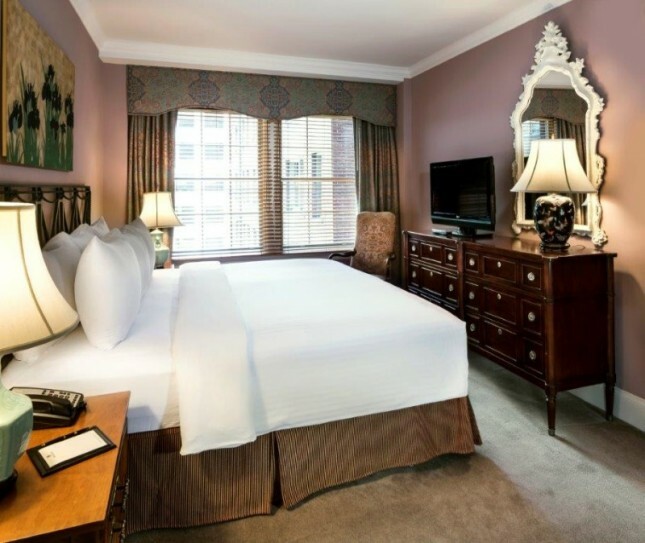 The beauty, history and culture of Washington, DC is all within reach at our landmark hotel on Pennsylvania Avenue. 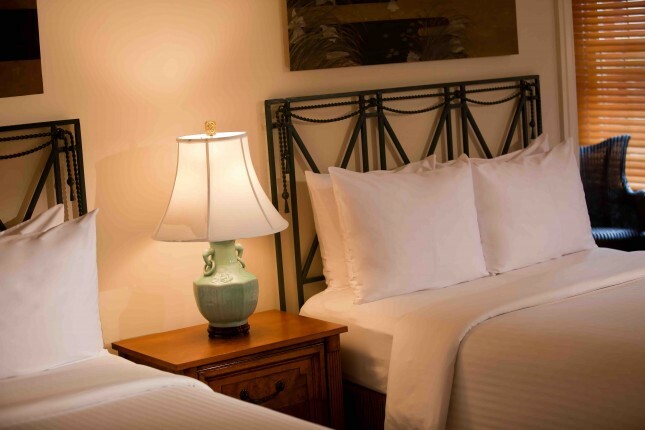 Our large Deluxe two-double bedded room is an average of 375 square feet and features a Sealy Posturpedic mattress with Luxury Frette bedding and duvet. Enjoy a comfortable work space for your laptop or presentations, and each room is equipped with a 32" inch LG LED Full HD television. 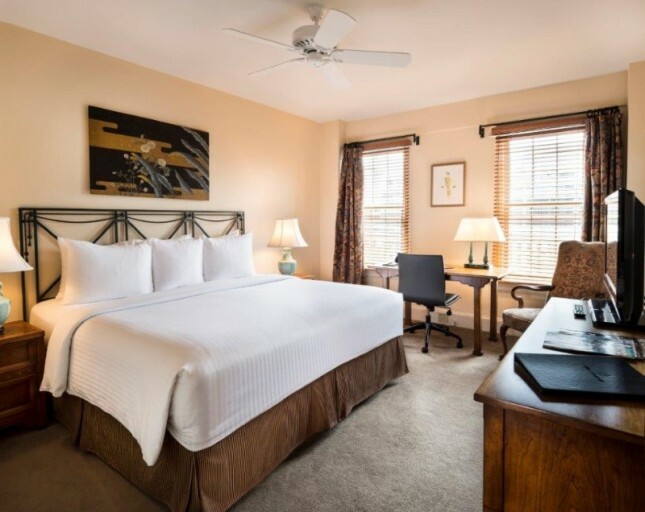 Room features 2 two-line telephones with data ports and voicemail, bathrobes, hairdryers, iron and ironing board, stainless steel wet bar with cozy cafe seating, deluxe bath amenities, custom upholstered vanity, ceiling to floor mirrored closet doors and current periodicals. Maximum capacity for this room is three 3 people, with existing bedding. 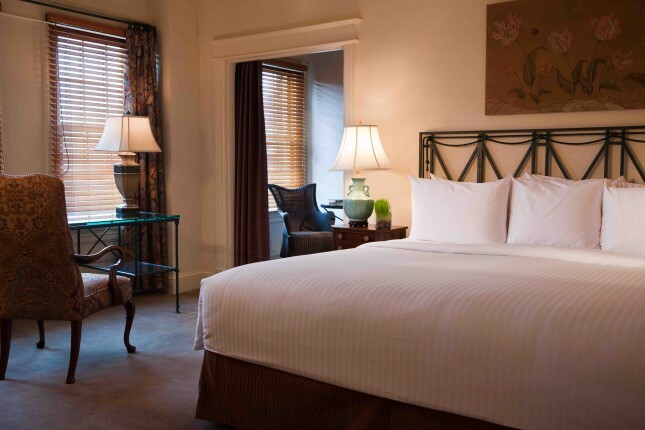 Our Executive Parkview King offers an attractive and inviting view of Pennsylvania Avenue. 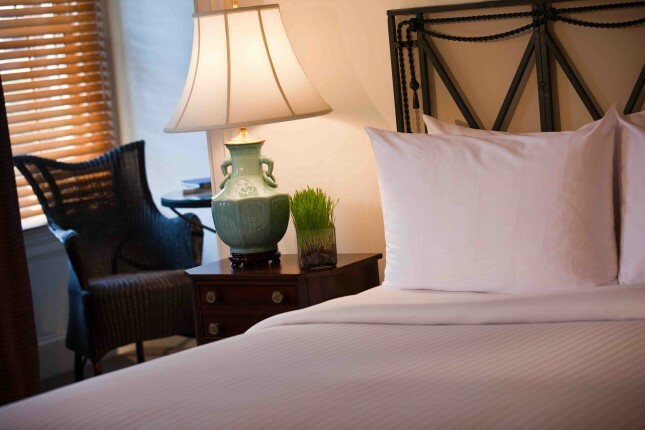 The lighting is superb and the room itself is nearly 400 square feet and is equipped with a 32" inch LG LED Full HD television and a Sealy Posturepedic mattress with Luxury Frette bedding and duvet. This room features a two-line telephone with data ports and voicemail, complimentary Wi-Fi access, bathrobes, hairdryer, iron and ironing board, mini bar, deluxe bath amenities, custom upholstered vanity, ceiling to floor mirrored closet doors and current periodicals. Maximum capacity for this room is two people. Treat yourself to our Parkview one-bedroom suite with separate living area and sofabed with an average of 575 square feet. The suite is equipped with two 32 inch LG LED Full HD televisions. The bedroom king has a Sealy Posturepedic matress with Luxury Frette bedding and duvet and the living area has a pullout sofa bed, also spacious enough for a small meeting, this room features two-line telephones with data ports and voicemail, complimentary Wi-Fi access, bathrobes, hairdryer, iron and ironing board, mini bar, deluxe bath amenities oversized walk-in closet and current periodicals. Maximum capacity for this room is 3 people, with existing bedding. *Maximum 4 rooms can be booked in a single reservation.